Lake of the Ozarks, Mo. - Recreational adventure comes in all varieties at Ha Ha Tonka State Park and Lake of the Ozarks State Park at Central Missouri's Lake of the Ozarks. Hikers, cyclists, sightseers, horseback riders, campers, anglers, kids, boaters and nature lovers of all ages can find a formula for fun among the borders of these two treasures of the state park system. 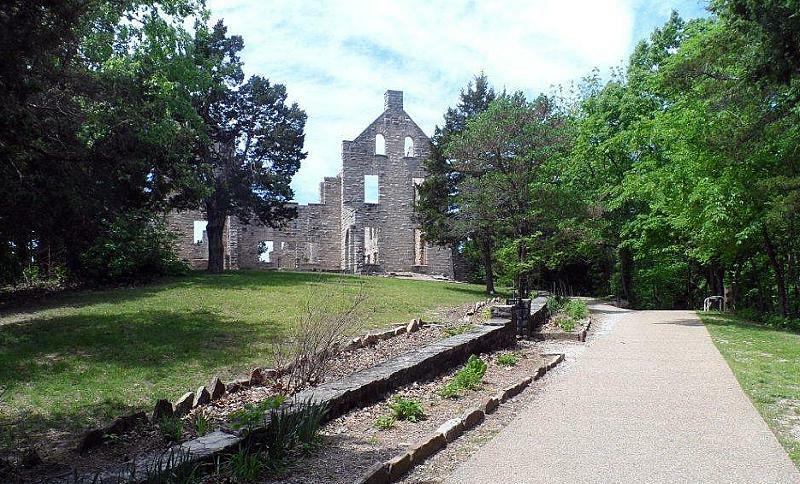 Ha Ha Tonka State Park, established in 1978, has 3,709 acres to explore and is home to one of the most fascinating sites and stories in Missouri: The ruins of a European-style "castle," perched high atop a bluff overlooking the Lake. A paved walking trail leads visitors from a nearby parking lot to the bluff-top ruins (and some spectacular views of the Lake). Robert M. Snyder, an affluent Kansas City businessman, envisioned the unique edifice at the turn of the 20th century. Snyder began construction on the castle in 1905, but died in one of Missouri's first automobile accidents before it was completed. Snyder's children finished construction on the castle and in later years it was operated as a hotel. In 1942, the interior of the property was destroyed by fire and the castle was never restored. Today, only the ruins remain. Nature shares the spotlight with the castle ruins at Ha Ha Tonka. The park features eight caves, some of which were used as hideouts by bandits and others were used as Native American sacred places. Other natural wonders at Ha Ha Tonka include a 500-foot by 300-foot sinkhole called the Colosseum, a natural bridge 60 feet long and 70 feet wide, a glade and a woodland area with over 400 species of animal and plant life. Ha Ha Tonka is also home to Missouri's 12th largest spring (named after the park), which discharges approximately 58 million gallons of water daily into the Niangua arm of the Lake. Each of Ha Ha Tonka's 14 diverse hiking trails gives visitors easy, up-close access to the park's natural beauty. 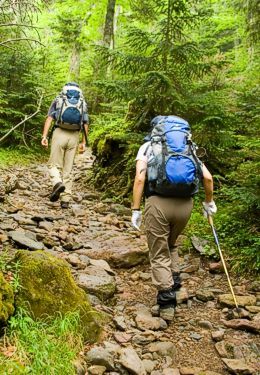 These trails appeal to hikers and backpackers of all ability levels, with walks that can range from as short as 10 minutes to as long as six hours. 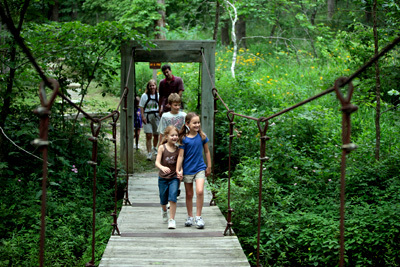 For a full list of trails at the park, visit MoStateParks.com/Trails/Ha-Ha-Tonka-State-Park. The park offers interpretive programs on a wide range of topics year around. Special group tours of the castle and interpretive demonstrations of the area's karst geology can be arranged in advance with the park naturalist any time of year. For more information about these programs or to arrange a group tour, call the park office at 573-346-2986. Ha Ha Tonka doesn't accommodate overnight stays, but there are several bed and breakfasts, hotels, motels, campgrounds, RV Parks and resorts nearby. For more about these Lake-area lodging properties, please contact the Lake of the Ozarks Convention & Visitor Bureau at 800-FUN-LAKE (386-5253) or visit FunLake.com. The Lake of the Ozarks State Park, on the Grand Glaize arm of the Lake, is the largest state park in Missouri with 17,441 total acres and over 85 miles of shoreline. The park was originally established by the National Park Service as a Recreational Demonstration Area in the 1930s but was turned over to the Missouri park system in 1946. With an assortment of opportunities for both recreation and natural exploration, it's no surprise that Lake of the Ozarks State Park is not only Missouri's largest but also one of its most visited, with over one million guests annually. Visitors wanting to discover the variety can choose from one of the park's 13 trails. These trails range from under a mile to over 13 miles long and there are trails for walkers, joggers, hikers, cyclists, horseback riders, boaters and backpackers. Hikers and mountain bikers can explore the park's specifically designed walking and biking trails, including the 30-minute White Oak Trail and the12.75-mile Honey Run Trail. 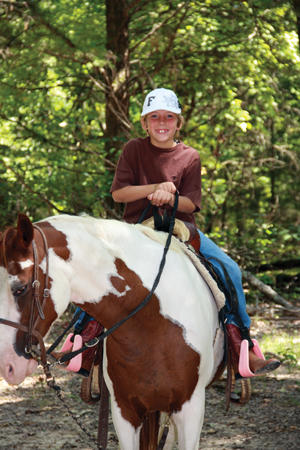 Equestrians can rent a horse from the park's stable or bring their own mount to ride on one of three horse trails, including the multi-purpose, 13.5-mile Trail of the Four Winds. The park even has a 10-mile Aquatic Trail for boaters wishing to take in the natural sights. For more information about these trails, visit MoStateParks.com/Trails/Lake-Ozarks-State-Park. Recreation can be found on land or by lake, in two playgrounds and two sandy-beach swimming areas. Fishing and watersports are also popular activities at Lake of the Ozarks State Park with two marinas and three paved boat launches available to the public. 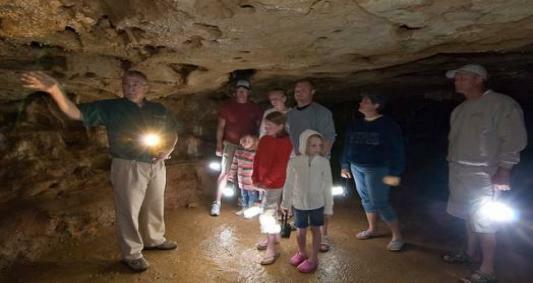 One of the park's attractions is Ozark Caverns, a short-but-roomy cave that offers a hand-held lantern tour - one of the few caves in the state that offers such an excursion. And, its showerhead bathtub formation called Angel Showers makes it one of only 14 known caves in the world to feature this unusual type of cave feature. Tours are $6 for children ages 6-12, $7 for youths ages 13-20 and $8 for adults. Children 5 and under are admitted free with an adult's paid admission. For more information about the cave or the various available tours, call the park at 573-346-2500. The park staff also offers interpretive evening programs, nature walks, cave tours and other programs at the main campground and at the Ozark Caverns Visitor Center. To find out more about these programs or to arrange for a special group program, call a park naturalist at 573-346-2500. The Summer season is loaded with fun fairs, festivals and events at the Lake of the Ozarks. For more information about getaway packages, lodging, dining, shopping, events and attractions throughout the Lake area, contact the Lake of the Ozarks Convention & Visitor Bureau at 800-FUN-LAKE (386-5253) or visit the Bureau's website, FunLake.com.